We used a lot of "library music" in those days and into the Dubbing Theatre in Lime Grove one morning in 1955 came young De Wolfe (well he was, then!) bringing some new music tapes for us to copy some tracks. "Be very careful with these" he said, "as we haven't cut the disc masters yet". A similar thing once happened earlier on the radio, which I heard about from a friend in BH (Broadcasting House). And thinking of the BTR tape machines reminds me of an incident that was related to me. 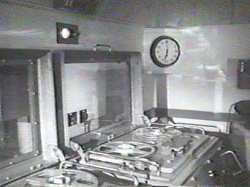 When the BTR1 was superceded by the BTR2 tape recorder, Recording Division put in an order for them to re-equip its facilities throughout the BBC. But since in the past, orders from Departments had tended to be halved by the financial people, the order for BTR2s was twice the number actually required. However, for once, this time the order was not halved, and when all these BTR2 machines were delivered, having nowhere to go, they littered the corridors. 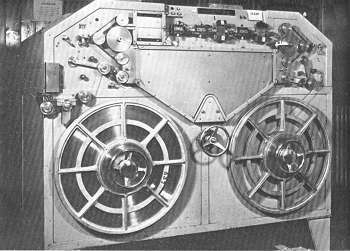 The BTR2 recorders, which superceded the BTR1, both made in England by EMI, became an "industry standard" in the BBC. They were used in studio centres throughout the UK. Edward Pawley, in his book BBC Engineering 1922-1972 gives a description of this system. While on the subject of sound recordings, I am reminded that shortly after joining the BBC I went on an "induction course" which all new staff took. In this we were given a tour of many of the BBC's London studio centres. The tour took several days, and we met on the first day in Bentinck House in Great Portland Street, London. Our tour leader was Bruce Purslow, a most friendly man who had been EiC at Wood Norton during WW2, and after the war had been seconded to the Foreign Office, and based in Singapore. When visiting the Maida Vale studios I saw a Philips-Miller* recording channel still operational. This was early in 1953, even though Pawley in his excellent book states that the last channel was returned to Philips in 1950. The system used 3mm acetate film which was coated with a black layer. A sound track was cut into this layer producing a variable area soundtrack which could immediately be played back by a photocell as in cinema films. 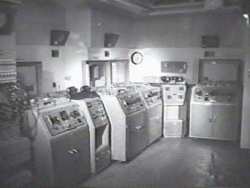 Many of the Tommy Handley "ITMA" wartime programmes were recorded on this system. What I did not see was a Marconi-Stille machine (though I had seen one in operation during my 1949 visit to the Swiss Broadcasting Corporation's studios in Berne).